same as original 2.4 - initial release - 16 kind of New Dragons are waiting your challenge! 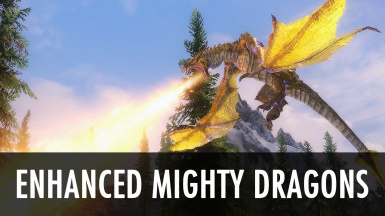 All vanilla Dragons are substituted by Enhanced Mighty Dragons! Medium diificulty and all nneded esps are merged into one single esp . This work is by Erkeil, I am not the orginal author. Dragons leveled for 1st level or low level players. – Dragons are very powerful respect of vanilla version. – Dragon breath is really tremendous. The breath is related to Dragon age so… older Dragons have deadly breaths. – Dragon bite is devastating. Stay away from the jaws of the dragon, because they are his physical attack more lethal. – Dragon quests (“going to kill the boss”) now are really challenging, they aren’t no longer a simple picnic (with Dragon meat). – Dragon tail may knockdown you. Stay away from Dragon tail! type of behaviour = Magic Dragon behaviour and Melee Dragon behaviour. – Each Dragon, according to his nature, type and age have a particular set of shouts to use in battle! – Dragons have a proper name (lore friendly) in relation to their age (level) and nature. – Alduin is really the world eater, a semigod of incredible powers. – Low level NPCs (from 1 to 9 level) have fear of Dragons and flee away. followers don’t go away and stay to fight the monster. – Each Dragon is more characterized and the Dragonborn need to know him very well before engaging a battle! medium) level players (from 1th to 12-15th level) are warned! – (OPTIONAL) As the Dragons, also Dragon Priests have became very hard enemies. Holy Book, a secret book written by Ancestor for the Dragonborn. – (OPTIONAL) You may have a new Odahviing, that become a really useful ally for the Dragonborn. – (OPTIONAL) You may have a new Durnehviir, that become a really useful ally for the Dragonborn. – (OPTIONAL) Reduced Dragon Respawn rate. protected = killable only by player. So they are safe by Dragon’s fury. If you are playing with old Mighty Dragons or ERSO modules, simply use this installer and overwrite the contents, when asked. Enjoy! call animals to its service. Disarm. His physical attacks are very deadly (more than Ai’Mul’Grah)! Powers: medium physical attacks. Invisibility Shout. Mayhem Shout. breath and Poison spit for fighting at medium/long range from enemies. foes that are near to him. It’s a terrible and deadly creature! Powers: Medium physical attacks. Dangerous Storm Breath. Lighting Storm, Wall of Storm and Lighting Cloak Shouts. fierce in melee combat. In fact, It doesn’t like using physical attacks. It prefers using his terrible electric breath for long range fighting. imprison his enemies; and It protects himself with a deadly shock cloak. It’ a truly badass encounter! Powers: Medium physical attacks. Invisibility Shout. Paralysis Shout. Cloak Spell and Wall of Frost Shouts. Rout and Mouffle Shouts. spirit is very Dark and ruthless. Powers: Dangerous physical attacks. Deadly Frost Breath and Icestorm. his useful spells. It’s a truly deadly enemy for the Dragonborn. Powers: Dangerous physical attacks. Deadly Fire Breath and Fireballs. Flame cloak ability. Paralyze and Conjure Flame Atronach Spells. useful shouts. It’s a truly deadly enemy for the Dragonborn. a terrible and deadly creature! HP: 4.000 (Slighty versions) / 6.000 (Mighty versions) / 8.000 (Super versions) / 10.000 (Nightmare versions). Powers: Weak physical attacks. Draining health/stamina/magicka Shout. Frost cloak and Muffle ability. Paralyze area and Conjure Draugr Shouts. Spectral Arrow Shout. Mayhem Shout. Invisibility Shout. Powers: Medium physical attacks. Terrible Fire Breath and FireBalls. Lighting Cloak and Ice Paralyzing Shout. element: frost. It’s the true Prince of the Sky. Atronach Shout. Conjure Storm Shouts. Powers: Medium physical attacks. Dangerous Storm Breath. Lighting Storm Spell. Wall of Storm Spell and Lighting Cloak Spell. Description: It’s a old and powerful Dragon: a very good ally for the Dragonborn! All Enhanced Mighty Dragons .esp (core and optionals) don’t use scripts. So that you can install/uninstall them without any problem. This mod is fully compatible with Dragon Combat Overhaul, but you have to load EMD before DCO. If you use ASIS, you have to insert Enhanched Mighty Dragons plugins under the “Mod exclusion” flag. So you will may spend Dragon Souls to improve you shouts!